The Turkmenistan Flag features a green field with a red vertical band on the left-hand side of the flag that displays five carpet guls (medallion-like designs that are traditional of Turkmenistan’s hand-woven carpets) that sit above two olive branches. 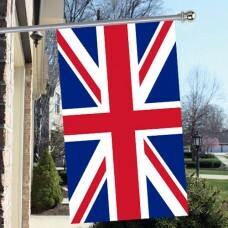 At the top of the flag, on the right-hand side of the red band, there is a white crescent with five white 5-pointed stars next to it. 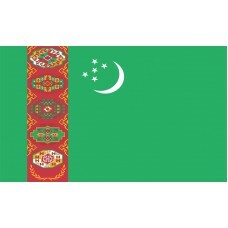 The green color is symbolic of Islam, the crescent is also a symbol of Islam as well as representing hope and a bright future for the country, and the five white stars represent the five regions of Turkmenistan which are, Ahal, Balkan, Dashoguz, Lebap, and Mary (which was formerly known as Merv). The red band that features the five guls represent Turkmenistan's famous carpet industry and are also a national symbol as well as being symbolic of the five major tribes of the country which are, Teke, Yomut, Saryk, Chowdur, and Arsary. 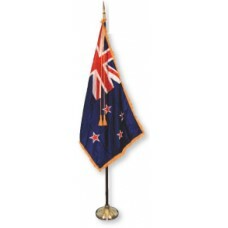 The olive branches that are below the guls represent the "status of permanent neutrality." The Turkmenistan Flag was first adopted on February 19th, 1992 and was modified on January 24th, 2001 and is considered to be one of the most detailed flags in the world. 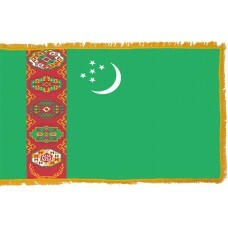 Prior to this flag, Turkmenistan used the flag of the Russian Empire. Turkmenistan (which translates as "Land of the Turkmen") is a landlocked country that is located in Central Asia. It shares borders with Kazakhstan, Afghanistan, Uzbekistan, and the Caspian Sea. The capital and largest city of Turkmenistan is called Ashgabat which also translates as "City of Love" or "City of Devotion." The majority of the country (70%) consists of the "Karakum Desert" which translates as "Black Sands." Turkmenistan is a country that has been at the center of many civilizations throughout history. It has been under the rule of Persian Empires, Mongol Empires, Alexander the Great, Turkic Warriors, and under the control of the Soviet Union. Turkmenistan finally gained independence on 27th October 1991, following the collapse of the Soviet Union. This day is a national holiday that is widely celebrated. Turkmenistan is very wealthy in natural resources, such as gas and is home to one of the largest reserves of natural gas in the world. The "Darvaza Gas Crater," also referred to as "Door to Hell" or "Gates of Hell" is a gas field that collapsed in 1971 into an underground cavern and became a crater. This gas crater is often visited by tourists. Turkmenistan is also one of the largest cotton producers in the world. Turkmenistan is home to many historical sites that are gradually becoming more popular and more visited. The ancient oasis-city, Merv (now known as Mary) that was inhabited from approximately 4,000 years ago is still home to many monuments that are regularly visited. The monument of Neutrality which is also known as "The Tripod" and located in the capital, Ashgabat is another popular attraction that was built to represent the country's neutrality.